Live Art Bistro are seeking expressions of interest from Hull based artists and collectives, working in performance, to contribute to a one-day takeover of Humber Street Gallery on 6th October 2018. 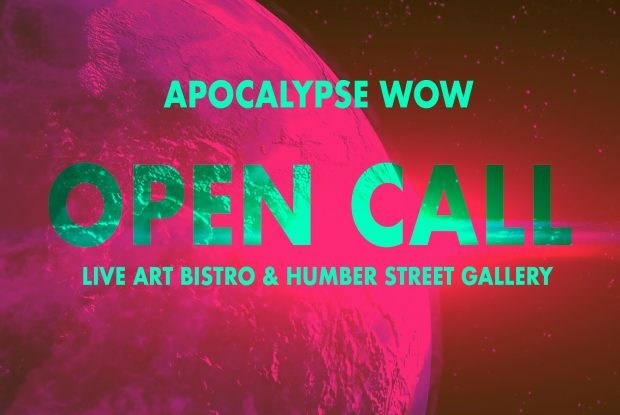 The event, titled ‘APOCALYPSE WOW’, will act as a platform for artists from around the UK and Europe, as they take control of all four floors of the gallery for an eclectic day of enthralling performances. APOCALYPSE WOW is a day long festival of performance art, activism and happenings that embraces the aesthetics of fear and dismay that we are bombarded with on a daily basis and reclaims this space as a point of departure. The first commission is looking for interventions that encourage audiences to interact with the work. This could be durational performance, participatory games or tasks, digital installations or any number of forms and ideas that play with audience’s relationship to the work and the city. Ideally proposals would connect to back to the city in some way and make use of roof terraces great views. Successful applicants will be paid £300 as a set fee for the selected idea, inclusive of materials and expenses. The second commission seeks three short and intimate performances that can be situated in the cafe/bar area of the gallery and are either 1-2-1 or for small audiences at a time. Ideally these performances would be sat at tables, but this is not necessary if applicants have other ideas. All proposals must be self-contained and non-disruptive to other activities in the space (i.e. loud noise, taking up too much space, excessive mess) The fee for these commissions is £70 each. Performances must be repeatable. Artists can apply with pre-existing work or new/developing work but still sit within the overall themes of the takeover. Applications must be forwarded to liveartbistro@gmail.com with the header “Humber Street Commissions”, who will then send through an application form for artists to fill. If artists have any queries, Live Art Bistro are more than happy enough to discuss in more detail over email.